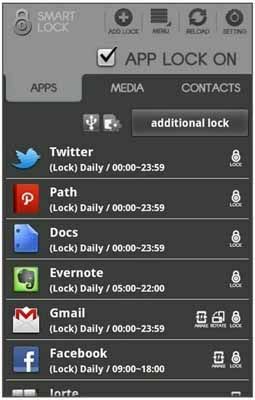 Free download Smart Lock Free latest version for Android with APK file. It provides your privacy in mobile phone from others. You can meet here the most essential App which hides Apps/Pictures/Media Files by managing password. Do you mind somebody executing Apps or taking a look to pictures and media files on your mobile phone? Smart Lock provides you lots of features such as locking App, staying awake and locking auto screen-rotate. No one can see locked Apps/Pictures/Media Files!!! Hide Smart Lock icon : It shows/hides Smart Lick icon in installed App list, Home Launcher.